While house-sitting in this beautiful location in West Lorne, we've had time to complete a few jigsaw puzzles. Our hosts showed us about 30 different puzzles to choose from. 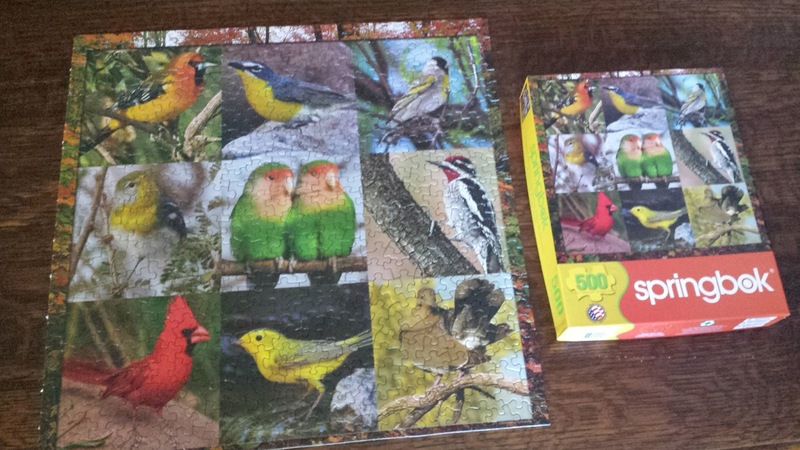 We avoided the 1000-piece puzzles and went for the 500-piece ones - as these seemed less daunting!! That being said, we did progress to a 750-piece challenger towards the end of our stay. 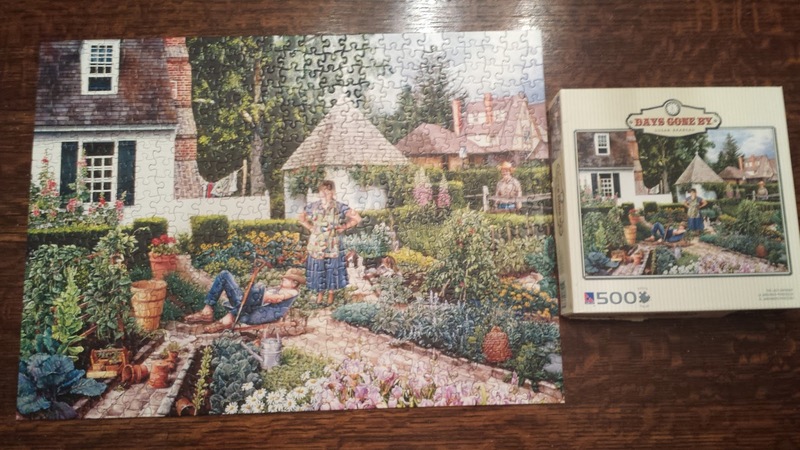 It's been years since we've attempted jigsaw puzzles and we only became addicted to them again as a result of frequent visits to our family in Ajax. 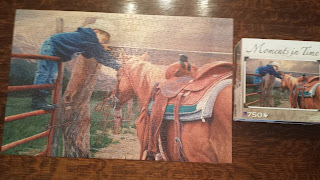 From those visits, we have rekindled the fun of doing them - from the laborious initial sorting to the exciting placement of the very last piece. 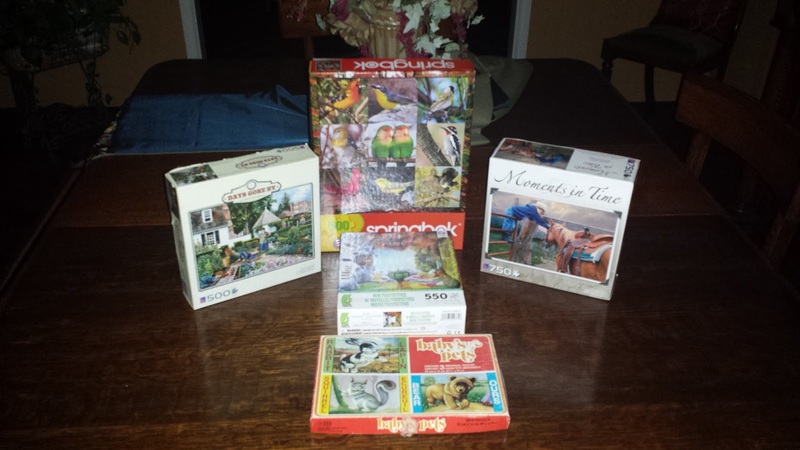 Those of you who also enjoy jigsaws, will understand the gamut of emotions undergone while solving them. It usually starts off with fervour and anticipation of completing the edge first. Then comes the obvious bits that are easy to identify and place within the perimeter. It doesn't take long to lapse into the frustration of looking for that one piece that will tidily complete an area - it's usually found when you're not looking for it! And there's always a time when we begin to refuse responsibility - when we're convinced that their MUST be a piece missing. It can't possibly be our problem - it's someone else's! 4 Seasons - we thought this one was neat! We find that, to alleviate these mixed emotions, we step away from it at times, get involved in something else, and then come back to it later. We have often found that we locate that 'key piece' when we are refreshed - and when we come at it from a different perspective. And then... there's that sky!! That's when we have sometimes quietly cursed the creator of the puzzle - why so much blue, without any different hues or shades? Not even a cloud or two, for a clue! 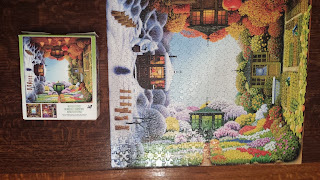 It's the part of the puzzle that is usually left until last - and then it's a case of trial an error, testing every piece in all of the possible nooks and crannies that are left. Lo and behold, the point of no return is reached as you race to find the final few pieces that lead to the ultimate triumph! Oh, how the tension and excitement builds when you can see the end in view! Finally, satisfaction is reached and the picture is complete. 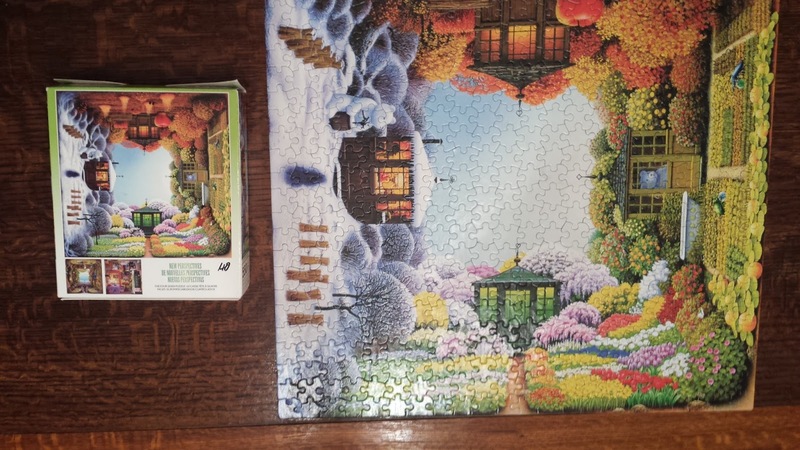 During our two weeks here, while we've been doing these jigsaws, I have found myself reflecting on how this experience is so much like life, itself. From cradle to grave, we repeatedly go through a similar catalogue of emotions - and often react in comparable ways. We start off with excitement about future possibilities, applying ourselves willingly to reach the goals we have set for ourselves. Then, when things don't work out as quickly as we'd hoped, we fall into frustration, blaming self or others, complaining that we must be missing some skills or resources that are preventing us from reaching our target. We can even find ourselves in convincing mode - where we persuade ourselves that there is some grand design that is deliberately thwarting our path! Sometimes, we feel the need to step back from issues for a while, and come back to see things from a different angle. At other times, we find a solution in a different place from where we were looking for it. However, just like with the jigsaw puzzle, if we accept responsibility, and continue to apply patience, we begin to see light at the end of the tunnel and the fuller picture comes into view. When we finally reach our goal, we can look back and see that everything fits perfectly in its place and we can rest in the satisfaction of a job well done - until the next time! 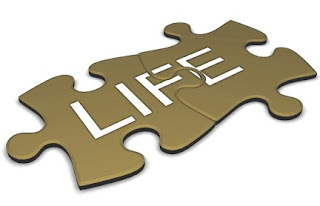 The jigsaw of life can be challenging at times, for sure; but if we change our approach and take life piece by piece, maybe we can actually enjoy the journey. By keeping the end in mind, accepting the ups and downs, and moving gradually towards whatever we have defined as an improvement in our current experience, maybe we'll discover the truth immortalized by John Lennon: 'Life is what happens to you while you're busy making other plans'. 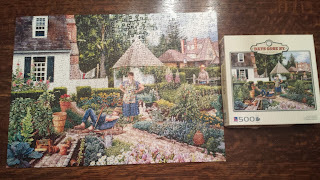 You'll notice a 5th puzzle at the front - this was our bow to ease and relief - 8 pieces each!! Patsy's Prize Pub - a Tilbury Treasure! !